Thank you Around the World ARC tours for letting me be on this tour! In this book we meet Gemma, a girl who has a love for the water. She lives with her older sister Harper and their dad. In the beginning of the book she’s trying to go for her night swim when her car breaks down. Enter Alex. He’s the boy next door and Harper’s best friend. He offers Gemma a ride and everything changes from that moment on. But Gemma has more to worry about then just the boy next door. There are three girls visiting the town and they are full of trouble. I read Trylle trilogy a while back, before they were printed, finding Amanda’s writing interesting. Amanda has a unique way of writing her stories and Wake is an example of that. I loved the characters in this book. Gemma had to make some serious decisions and she did so well. Her relationship with Alex is both sweet and romantic, bringing that innocence into the story. I really enjoyed Alex’s character. He’s the perfect boy next door, but he also stands up for what he cares about. Harper was a fun character, even with all of her overbearing tendencies. I thought she was the perfect big sister trying to be mother, and was well written. Daniel, the guy that gets close to Harper in the way she doesn’t usually allow people, is probably my favorite. He’s fun and real, making Harper see things the way she needs to. Honestly, I probably loved Alex and Daniel the best! The three girls, the enemy, are written a bit like your typical mean girls, but there is also a underside of cruelty to them. Overall, the book was a good beginning to a series. There was action, there was struggle, and there were some seriously hot boys. I’m definitely looking forward to finding out where Amanda takes these characters next. Wake comes out August 7th! Let me know what you think! ← Book Spotlight: The Hunt by Andrew Fukuda with Special Treat! I'm a little hesitant about this series. I've read Hocking's “My Blood Approves” and “Trylle” and had mixed feelings. The characters were good, but they seemed to be a little unpolished. I hope that, with a editing team now, some of the things that irked me about Trylle will be smoothed out here. 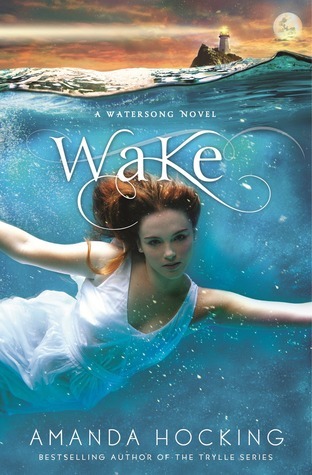 I'm definitely willing to give “Wake” a try, though I'm curious to see how Hocking will pull off a has-it-all main character. I sometimes find those hard to relate to. I've read the first two books in 'My Blood Approves' series. I think the 'Watersong' series is going to be better than her other series. Think I'd lay my hands on 'Wake' when it comes out. I'm in love with the cover.